Compared to moving boxes, moving people is not a good business. For one, people don't like to get shipped out of remote airfields at 3 a.m., or packed in the back of tractor trailers for 15 hours if a thunderstorm grounds planes. The infrastructure needed to move cargo is also a lot more intensive and costly, so a low-cost packaging company cannot just start delivering packages and steal FedEx's market share. A nationwide network is needed to make a profit, and the only companies that have the network are FedEx, United Parcel Service and DHL. In the package delivery business. the competitive table is already set. Still, as the commercial airline industry hits turbulence, there are a few lessons that can be learned from overnight package-delivery giant FedEx. FedEx has been able to weather the economic storm in the U.S. by raising delivery rates and adding fuel surcharges --something the commercial airlines are only now starting to do--for fear of losing precious customers. "In this country we believe it's written into the Constitution that everyone can travel by air," said Morgan, Keegan, & Co. analyst Arthur W. Hatfield. "The government encourages irrational pricing so people can fly, but quite frankly not everyone should be able to afford to fly." Not FedEx, which operates the world's largest airline. If a customer can't afford to send a package, that's the customers' problem. FedEx built its business model on the premise that it could pass along fuel-cost increases to its customers in the form of a surcharge. It has also been raising its delivery rates to try to offset the high price tag on fuel. Another plus for FedEx is that it owns other forms of transportation, so if fuel costs make flying prohibitive on some routes, it can use its trucks to make deliveries. --Fly into out-of-the-way airports instead of major hubs like New York. --Set prices according to demand and the cost to the system. While FedEx charges more for next-day air, airlines charge fairly flat rates across the board, whether a customer is flying at rush hour when traffic is high or not. It would make for a more efficient system to stagger prices. --Recognize that reliability is the No. 1 priority to the customer. --Realize that information is part of the product. With FedEx, customers can track their packages from origin to destination. --Marrying the right equipment to the right marketplace. For example, use smaller planes to fly from Fargo to Fresno, says Aaron Gellman, a professor at the transportation center at the Kellogg School, Northwestern University. --Identify a unique market. Although passenger airlines try, they face more complicated tastes, said Gellman. "Individual customers are different than sophisticated, industrial customers," he said. Some commercial airline passengers want rock-bottom prices. Some want as much luxury as possible. And some want everything in between. Zoning in on a unique market will help passenger airlines increase profitability. --Innovate with new technology. FedEx has a tendency to innovate, which the commercial airlines can learn from. For example, Fed Ex developed the hardware to make 727 airplanes quieter so they could pass regulations, Gellman said. The passenger airlines can learn that returns are high for advanced technologies. --FedEx is a major hedger of fuel. Most passenger airlines do not have the liquidity or leverage to hedge, which means they get hit hard by soaring fuel costs. Yet even FedEx is hurting from surging fuel costs and the slowdown in the U.S. economy, which has dampened demand for its U.S. domestic express package and less-than-truckload freight services. In May the company slashed its fourth-quarter earnings forecast to $1.45 to $1.50 per share, down from its previous forecast of $1.60 to $1.80 per share. "From a commercial airline standpoint, if they raise their prices, too many people stop flying" and the company goes out of business, says John Scholle, an economist at Global Insight. "Consumers just won't go on vacation or will jump in a car, and businesspeople will just have a phone conference instead. 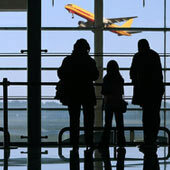 Demand is very sensitive in commercial airlines." For FedEx, if rates get too high, customers may shift from next-day delivery to two days or more, but it won't necessarily lose the business. Imagine trying that with passengers. Like JFK, EWR, LAX, ORD, DFW, IAH, PHX etc? I think, on this point, he might be thinking about Southwest. For each of the airports that you listed, there has to be 5 or 10 smaller, out of the way airports that we do fly out of. It's a good article and that statement is quite true. Everyone does feel it's their god given right to hop on a flight, wearing anything to almost nothing, and they then expect to be treated as royalty. It was much better in the 60's when air travel was a significant deal, and people both dressed and acted as if they were riding on the Queen Mary. Then pilots were revered, now they are loathed at worst, or tolerated at best. Did I see "727" and "advanced technology", in the same paragraph? "Ruthie" is full of beans. There are so many inconsistencies and non-sequiturs in her article that it hardly merits a repost, much less a response. Somebody should confiscate her pencil, before she writes again. She is further proof that an a$$ is a terrible thing to waste. 1) "If 'the customer' is more than 6 feet long or too heavy for the driver to pick up, it will probably be much cheaper for him to travel by semi-truck"
2) "If 'the customer' is found to be leaking, he or she should be removed from the aircraft and set aside, and Hazmat called"
I thought FedEx didn't hedge fuel. BTW, I love the picture of the DHL plane taking off in the background. ... BTW, I love the picture of the DHL plane taking off in the background. I guess we taught them.